Imperial luxury, a romantic waltz between lovers, and Renaissance artwork inspired this old world villa wedding shoot! Fine art photographer Olga Makarova drew on her love of the novels of Tolstoy, Chekhov and Pushkin to envision this shoot that opens a window to the past. You can practically hear the strains of the orchestra echoing through the frescoed halls of the Villa Medicea Buti as the beautiful bride and groom share their first dance! When it came to bringing the romance of the 1800’s to life in the present day, this incredibly talented team found the perfect balance! The authentic frescoes and lovingly preserved history of the Villa Medicea Buti provided the perfect old world setting for this blend of centuries. The bride and groom look as though they could have stepped out of a black and white portrait, while the flowers practically appear painted by the hand of a master. The bride’s Ela Siromascenko wedding dress was the epitome of vintage luxury, with a cape of silk chiffon that offset the on-trend sheer lace bodice. Valeriya Azaryonok created a romantic half updo that was as timeless as it was beautiful, and dresses it with a spray of gold leaves and gleaming pearls. The groom’s tuxedo and black tie suited the moody and enchanting lighting that echoed the 18th century artwork on the walls. Artemisia Fioristi took inspiration from the Renaissance paintings that adorned the villa to create still life inspired floral arrangements. Vibrant flowers and jewel toned fruits created a splash of painterly color in antique silver vessels. 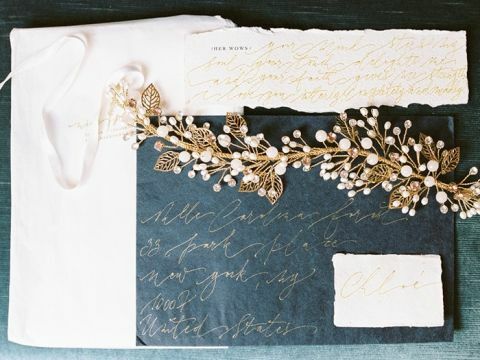 Nice Plume accented the fine art inspired table decor with hand made paper stationery that combined the art of calligraphy with a modern printed type!